See us for great values on Trollbeads. Trollbeads are an incredible way of telling a story. Pick the ones that remind you of a specific event, person or time in your life. We carry a huge assortiment of beads, accessories for you to create your unique piece. About Trollbeads: Handcrafted from the finest quality raw materials including 18K gold, sterling silver, Italian glass, natural pearls, precious stones and Swarovski crystal, each bead is a treasure to behold. Every irresistible piece has its own story inspired by love, nature, fairytales, mythology, cultures, and the diversity of the world around us. 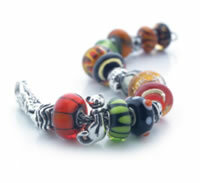 There are over 500 interchangeable Trollbeads to choose from. New beads in intriguing shapes and colors continue to revitalize the collection. With an infinite number of combinations, the piece of jewelry you design will be completely unique and personal. The possibilities are endless. The beads are created by more than 500 artisans. they are crafted from the finest materials such as 18 karat gold, sterling silver, gemstones, pearls, and Italian-quality glass, the beads are inspired by mythology, nature, and the everyday moments of life. Choose beads that have meaning to you, and create beautiful jewelry that tells your unique story. Get inspired! Browse our collection of completed bracelets for inspiration to create your own unique Trollbeads keepsake. photos & description courtesy of Trollbeads.